Jim with his car. See the Curry logo? 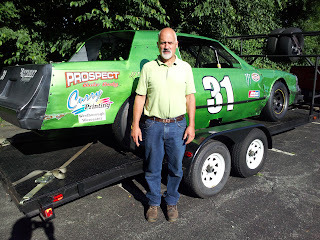 Jim Bendiak, an employee of Curry Printing, moonlights once a week as an amateur stock car racer at Connecticut’s Thompson International Speedway. Jim manages the bindery or finishing area at Curry’s main production facility in Westborough, Massachusetts during the day and enjoys racing for fun on Thursday nights with his sons Patrick and Nick at the race track in Thompson, Connecticut. Jim and his sons got involved in racing over 6 years ago when Patrick went away to college. Patrick had raced dirt bikes in the past and Jim thought it would be a great hobby for them to focus their attention on while Patrick adjusted to college life. So, they found a car builder named Bob Fill from BFR Racing and went to work building a car. It took almost a year to complete but Jim and Patrick have been racing ever since. Jim has worked at Curry Printing for almost 4 years. Before coming to Curry, he owned a print and imaging business located in Franklin, Massachusetts for almost 20 years. Check out Jim on the track!